At the end of this one day course delegates will gain the tools, skills and strategies to confidently conduct meetings for a variety of purposes. I really enjoyed this course and Stephen made many great recommendations to how I can improve in how I conduct meetings. Below are some extracts from our Conducting Meetings manual. Where you hold the meeting can greatly affect the outcome. You need to think about what sort of atmosphere you are trying to create. If you are holding an informal, creative brainstorming meeting, a room with soft chairs and a relaxed atmosphere will probably encourage people to open up and suggest ideas more than in a formal boardroom. It might also be better to be in an open plan area rather than behind closed doors. If you are trying to present a professional image to a client or need to have a formal meeting with a tight agenda, sitting around on soft chairs will probably not generate the right impression or result in a very effective meeting. Here you want a room with a large table and chairs arranged around each side, ideally with the chairperson at top of the table. A large room for a small number of people can be a little intimidating. Equally a small room with too many people can become uncomfortable. Pay attention to ventilation, because if a room becomes too stuffy it can have a bad effect on concentration levels. Ideally, also you do not want any distracting noises, views or interruptions. Holding a meeting away from the normal environment can be extremely beneficial. It is most suitable for ‘think-tank’ meetings where you are trying to determine strategy or a long-term vision. Being totally away from the workplace prevents distractions and can generate a more creative climate. Being off-site also has the added dimension of socialising, particularly if there is overnight accommodation or an evening meal after the day's events. This can be useful for team building and encourages people to relax and open up. Being invited to such an event can be recognition for people of their position as a highly valued member of the team. All delegates facing front‐centre on round tables. Presenter normally works from the front-centre area of the room. Ideal for small group work. Used to present in front of small to medium groups. Delegates (in ones or twos) have own workspace. Ideal for testing and individual training. Seating around three sides of the room ‐ good for presentations from the front. Square layout conducive to discussion. Presentation space in the centre of the room. Appropriate for groups fewer than 40 where there is a group leader or panel seated at the head of the setup. Used for product launches, presentations, displays. Used to present to large numbers of delegates. Allows for optimal room occupancy with no obscured views. (can be adapted to a hollow square layout) Centrally located table, classic layout ideal for debate and discussion. Popular for smaller meetings. Just mentioning your participation in a common hobby, such as running, can seem strained or out of place in a conference room. Try to identify commonalities within the workplace. Avoid seeming like a stalker by explaining how you discovered commonalities in professional or personal interests. Citing a readily available reference tool instantly establishes business context and credibility. Rapport building is a vital skill for anyone who meets using conference calls. It allows business communication to become more efficient and more effective by acting as a platform for discussion. Participants then operate in a smooth flow of conversation, patience and mutual respect. An agenda is a meeting plan that outlines, in order, topics that will be discussed. This could be a formal or informal outline. An agenda can be very simple with one or two items, but time allotments for discussion are important. The success of any meeting is the attitude and leadership of the chairperson; you. In a meeting, the chairperson is the leader and, as such, must perform the same function as the leader of any working group. This is where the purpose of the meeting can be outlined. Those unable to attend should send apologies beforehand and these should be read out. The minutes should have been circulated prior to the meeting for all to read. Items not included in the main body of the agenda. 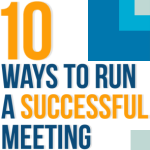 Not all meetings need to follow this structure, particularly if they are one-off gatherings. However, even with impromptu meetings, it is important that people are clear about the purpose. At the end of most meetings, there is usually some information to be communicated. Minutes are one way of ensuring that people know what took place at the meeting. Ideally, they should be written up as soon as possible and circulated if possible the next day. If you have been given the task of writing the minutes, the sooner you do it the more you will remember and the more accurate an account of events it will be. Minutes should be kept as brief as possible and should be an accurate account of what happened. It is a good idea to show the chairperson the minutes before circulating them just to check that he/she agrees it is an accurate account. Use an impersonal and objective style of writing. Try not to get bogged down with too much detail. Minutes are not the only method of communicating information after a meeting and are not always the best method. If two or three items on the agenda only affect certain departments, it may be preferable to send an email outlining those key points. You could also use the company newsletter or intranet for general information to keep staff up-to-date. Some meetings may take such major decisions that it is necessary to write and send out a report.